Classic among hikers, with many variations. Dessert or a midnight snack. Wonderful with Hikers’ Hot Chocolate – and even better with some vanilla sauce (ready made ones in the stores weigh a lot, make your own with the White Pudding recipe). Soak the apples in a tiny amount of water until softer (15 min or something). Melt the butter on a frying pan. Mix oats and sugars with the butter and roast few minutes, until little crispy. Keep stirring all the time, it burns easily. Add the apples and cinnamon. Feast directly from the frying pan or serve it beautifully with some vanilla sauce and hot chocolate. Traditional salad this is not – a warm salad is what I had in mind. Rich in flavor, great lunch. I’ve made this at home several times too. The first wilderness version was prepared in July 2012 at the Lemmenjoki National Park nex to the Ravadasköngäs waterfall. Rehydrate the feta separately from other ingredients. It takes quite a long time, make sure the inner parts are also rehydrated before cooking it. Rehydrate the eggplant, onions, tomatoes and paprikas. Cook quinoa until half done. Add the soaked vegetables (you can add the eggplan already earlier in case you didn’t steam it well before the dehydration) and cook until quinoa is soft enough – don’t make porridge, leave something to bite. Add soaked feta, sherry tomato slices and spices. Heat up for few minutes. Add oil and decorate the dish with roasted pinenuts. You can serve the warm eggplant salad with wild herbs and hummus sandwiches. 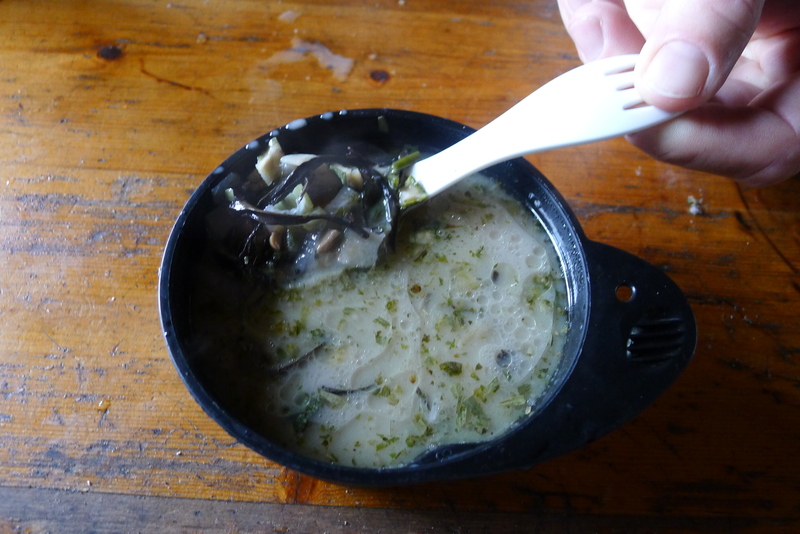 This soup was supposed to be a festive starter – well it turned out to be lunch one day at the campsite. It’s not a large portion, but at that moment it was enough – at least for my friend who enjoyed the reindeer version. This soup can be prepared all vegetarian, or with reindeer, or half and half. Rehydrate all dry ingredients in a small amount of water. Put them in a pan and steam the remaining water out. Add oil or butter and fry lightly. Add water and spices, bring it to the boil. 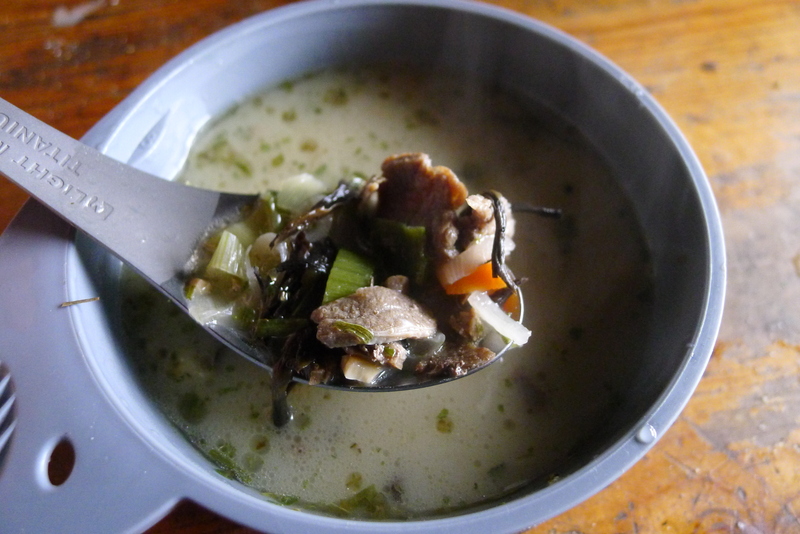 (If you have time, take a break and allow the soup to wait a while – this makes the taste more intensive. Eventually) cook the soup ready. Add cheese and let the soup melt into your mouth. It is of course a matter of taste, but I think millet porridge is better than rice porridge. It’s more nutritious too. This is quite a heavy portion. You can make it lighter by replacing figs with dry apples (less will do). Cashew-millet porridge can be eaten raw or hot. Thus this is a good recipe for emergencies when you might have lost your matchbox or run out of gas. Soak the millet and figs over night in 4 dl clean cold water (in case you didn’t remember to, don’t worry, the cooking time just gets longer). In the morning add cashew nuts and spices. Mix milk powder with 2 dl cold water and add it in the porridge. Cook until the porridge is hot. You can add some butter too. 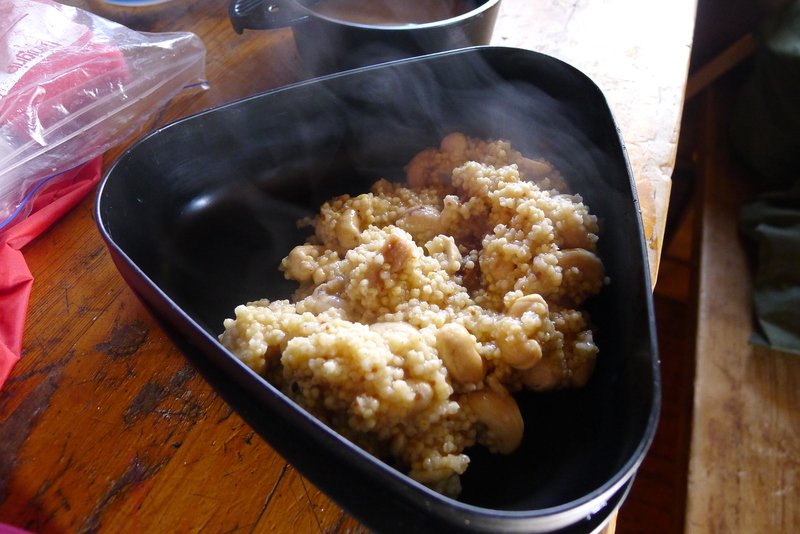 Soak the millet grain and figs over night in 4 dl clean cold water in an airtight container. In the morning pour out the remaining water. Add crushed cashew nuts and spices. Add more clean cold water if necessary. Mix milk powder with 2 dl cold water and serve it with the porridge (good also without). If you wish the porridge to be sweeter, add some honey. There are many ready made deserts in super markets, instant puddings and cakes – somehow I’ve never been interested in those. Nevertheless, deserts are luxurious in the wilderness. Here is a simple and fast desert: white pudding with berry stripes. Mix everything except the berry soup with 1 dl cold clean water in a pot. Add 4 dl boiling water and stir well. Boil it for 1-2 min. Put the berry soup mixture in a cup and add 0,5 dl boiling water. Mix into a jam. 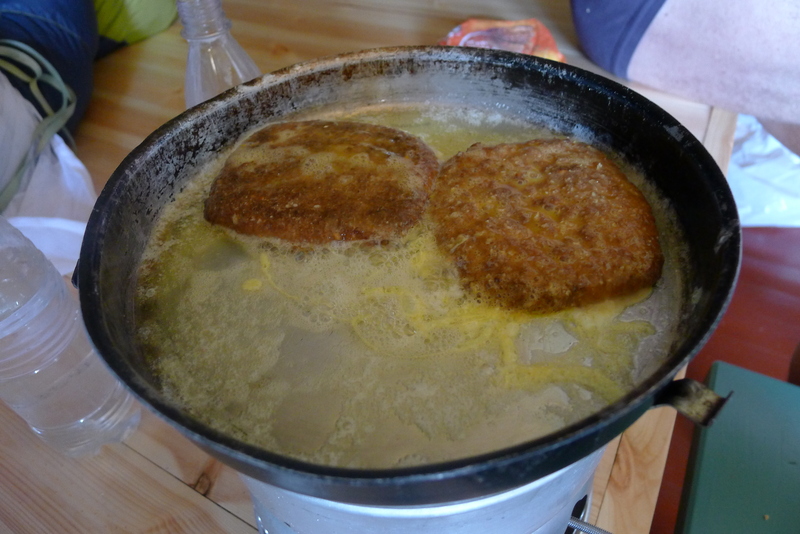 Pour the white pudding in two mugs and decorate it with the jam (or berry soup). Pike is not my favourite fish. But I tend to get them quite often. So many good pike recipes are needed. My three favourite ones are Garlic-shrimp-pike-soup, Pike in a Curry Sauce and Thai Pike. If you get a better fish than Pike, there are even more delicious things to do with it (eg. Sushi, Sashimi, Pickeled Raw Fish). Pike doesn’t turn into a salmon with this recipe. But the recipe goes well with salmon too. Clean the fish and cut it in file pieces. If you plan to cook a bit later, put the fish in pot with the spices and keep it cold (if this takes over night, add a touch of salt). 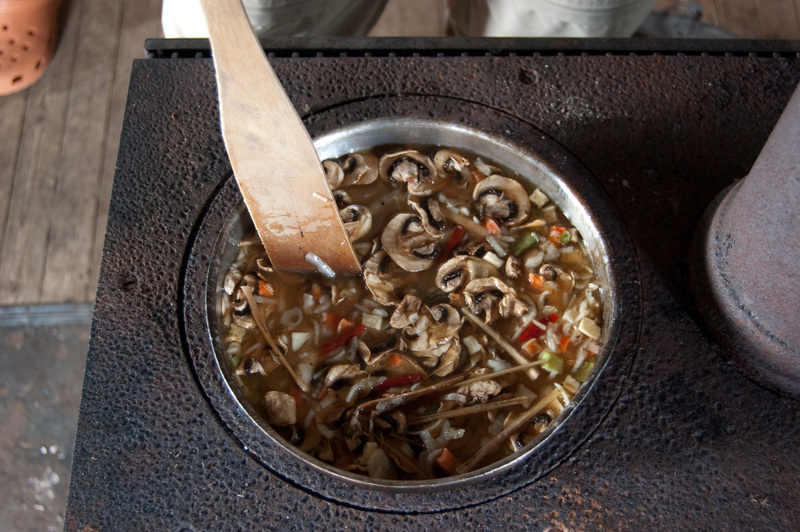 Rehydrate the dry champignons, onions, lemon grass and vegetables for at least 30 min in a small amount of clean water. Put the spices (scrape and shake them off the fish if you put them there first) on a frying pan with the vegetables and champignons and the remaining liquids. Bring to boil and add oil. Let it waite a while. Add the fish on the frying pan. Cook few minutes with the rest of the incredients, turn the fish around, cook few minutes more. Warm up the rice if it’s cold by now. One day I was visiting a russian friend of mine who lives in Berlin. For breakfast she made buckwheat porridge. At first I didn’t even want to taste it as I assumed that I don’t like buckwheat. 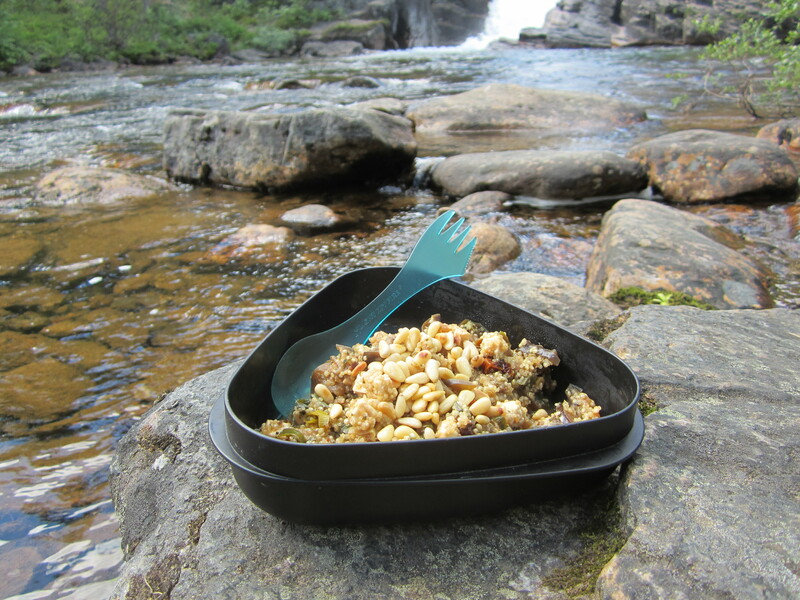 Surprisingly whole grain buckwheat appeared to be quite different from buckwheat flakes – totally different. I fall in love with this porridge. The portion looks smaller than what it feels in your stomach. Structurewise it stays grainy. 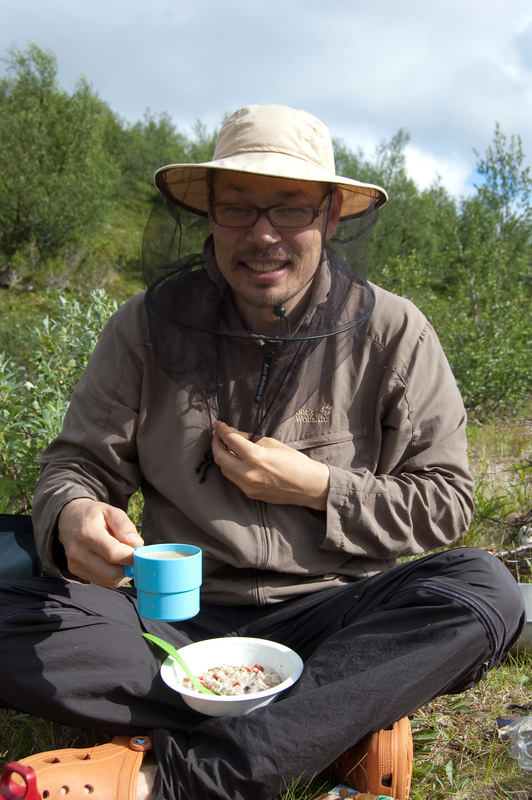 Clean the buckwheat well before the trip by rinsing it with cold, hot and cold water. Redehydrating it is a bit of an effort but makes it easier to use buckwheat in the wilderness. Soaking the buckwheat over night makes the cooking time shorter. Use about 4 dl of cold clean water. This porridge can be eaten also raw, without cooking. To make a hot porridge, boil the buckwheat until the water is out. Add butter and fry lightly. Add cranberries. Make milk by mixing 2 table spoonfulls of dry milk powder with 2 dl of clean cold water. 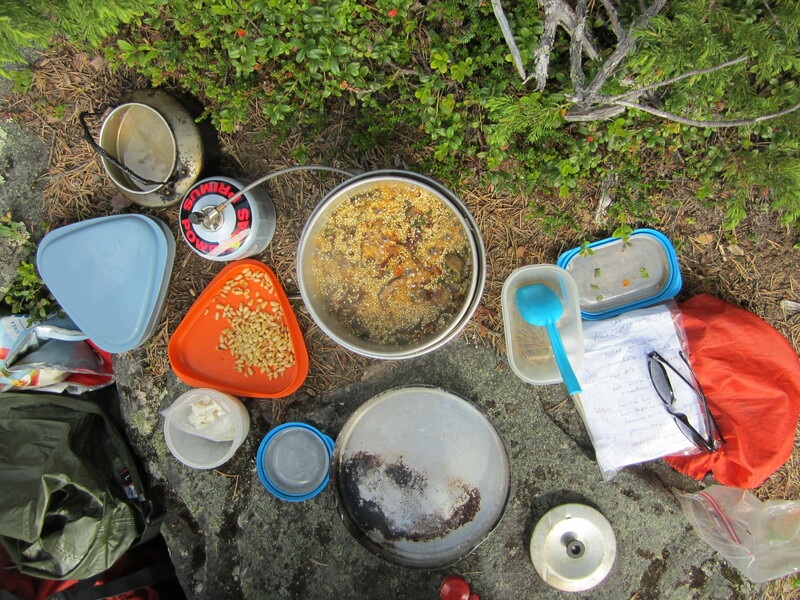 This is my most common hiking breakfast as it is fast and easy – and not much dishes to do afterwards. 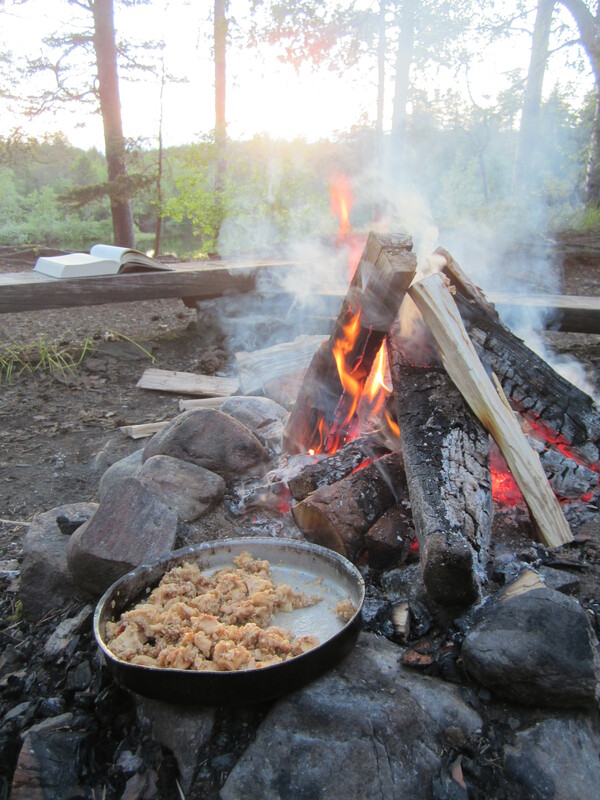 If you stay all day at the camp site or fishing, 70 g oatmeal is most likely enough. To begin longer walks, I’d recommend 100g or some quinoa based porridges. Devide the porridge ingredients on two plates. Pour boiling water (2,5-3,5 dl per plate) over it and stir well. Add butter. 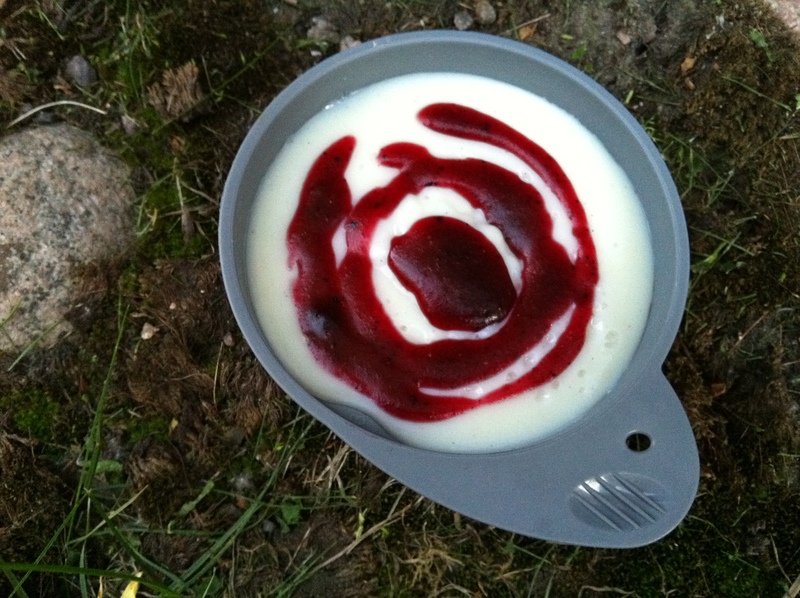 Serve the porridge with milk or berry soup: Mix dry milk with 2 dl of cold clean water. OR mix the cup-a-soup with 1-2 dl boiling water and make jam or soup with the porridge. Enjoy your porridge before it gets cold. Scale the fish and gut it. Clean it well. 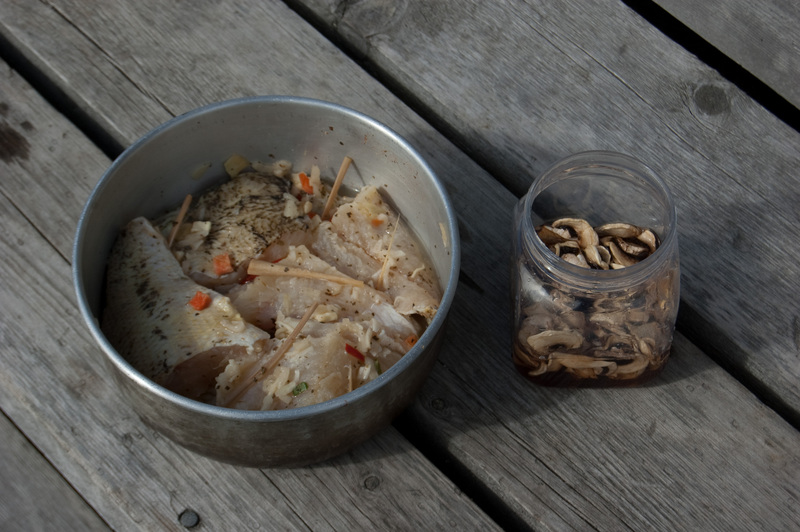 Cut the fish into large file pieces – match the size and shape of the container. Keep the skin on it. Put salt on the fish pieces as much as stays on them (both sides). Add other spices (not on the skin side). Sugar makes the fish soft, amount is up to your taste. Put a fish piece in the container skin down. Put an other piece on top of it so that the thicker part is on top of the thinner part of the other piece. 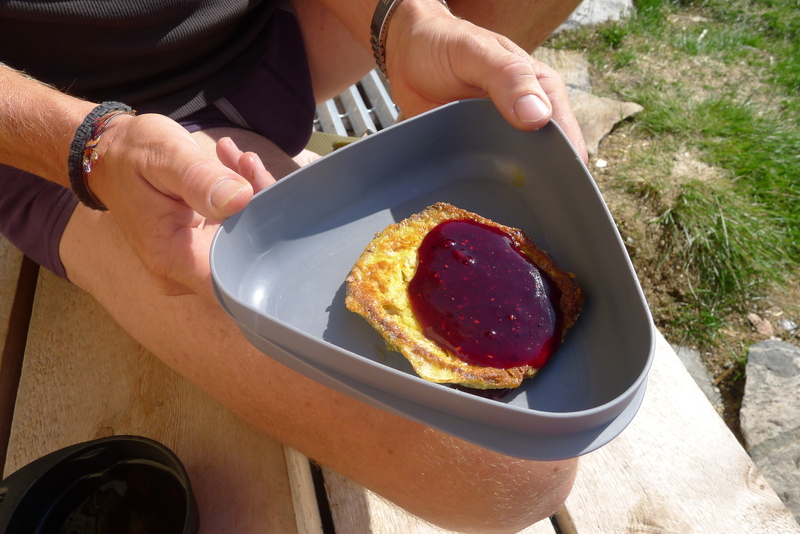 If the container doesn’t get full, put a baking paper over the last piece and somekind of weight. Keep it in a cold, fridge temperature for 12-24 hours. Rotate the container occasionally. Before eating the fish, skratch all the spieces off. Cut very thin slices and remove them from the skin. Thin parts of the fish will be ready first.